Company Infiniti published the first teasers of the new compact crossover, which is updated version of Nissan Juke. 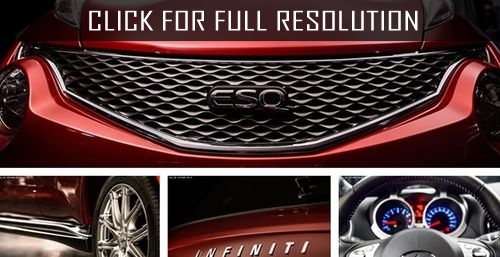 It is expected that the premiere of the new model which has received the name ESQ, will take place this year in China. It is known that this novelty will not get to the automobile market of Europe, however can lead to furor in China automobile market, where its sales start in the beginning of 2015. The SUV will be constructed on units of the "charged" option of the crossover – Juke Nismo. Infiniti ESQ get all wheel drive (AWD) system and a 1.6-liter engine which can develop up to 200 horsepowers and 250 Nm. The motor will work along with a variator. According to the revealed photos, novelty will differ from Juke with massive radiator lattice and exclusively designed large wheels.